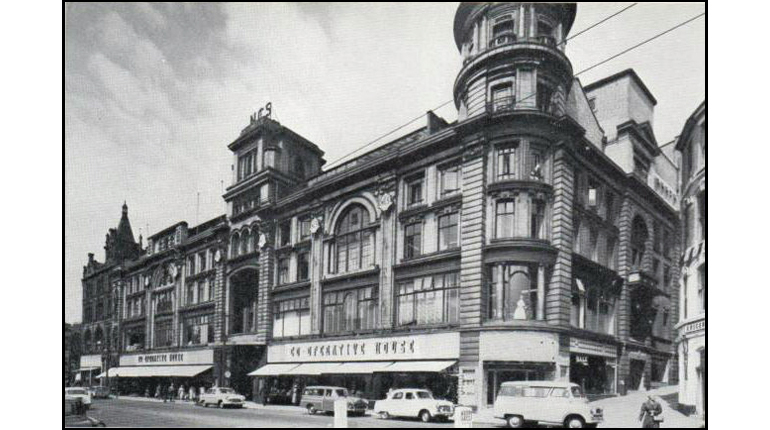 Nottingham Co-op's Store on Upper Parliament Street, Nottingham as it looked in the 1950s. Walking past the Greater Nottingham Co-operative Society's massive Parliament Street store or its modern counterpart in the Broadmarsh Shopping Centre, you may not realise that their humble origins rest here in Lenton. Of course the Co-operative movement drew its initial inspiration from the activities of thirty men, a number of them handloom weavers in the flannel industry of Rochdale. These Lancastrians were determined to better the conditions of their fellow workers who had witnessed their livelihood depressed below subsistence level by the introduction of power-driven machines. To this end, from 1844 onwards they began selling to themselves and their fellow workers good quality food free from the adulteration so common at the time. An added boon was the distribution of the surplus as a dividend or 'divi' to members in proportion to their purchases. Their example was soon followed all over the country. Often many of the more enlightened factory owners supported and fostered this consumer movement on humanitarian grounds and also because they desired their workmen to obtain foodstuffs as cheaply as possible thereby helping to reduce wage demands. 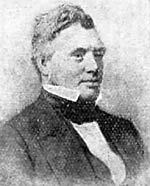 Two men Benjamin Walker and Thomas Bayley were instrumental in promoting this cause. 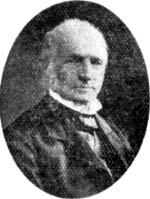 The former was head of the firm Benjamin Walker and Co., lace manufacturers, whose works were in Old Lenton, the latter was the head of the firm Thomas Bayley and Co., leather tanners with premises in Leengate. Both men took great interest in the welfare of their employees, both supported the temperance movement and both were champions of non-conformity and opposed the monopoly of the Church School in Lenton. They were determined to break this and opened a reading room in Gregory Street to that end. By 12th May 1863 the house on the corner of Gregory Street and Abbey Street had been taken over and the Lenton Industrial and Provident Society had opened for business. A certain Thomas Heap was appointed the first store manager at a wage of 20 shillings a week. The first bulk order of purchases he made for the shop has survived and shows record of basic provisions with few frills. 1 bag of Flour; 3 samples of black tea; 3 samples of green tea; 1 cwt. No.2 sugar; 2 cwt. No.4 sugar; 2 cwt. Granulated sugar; 2 cwt. Lump sugar; 1 cwt. Currants; 4 cwt. Rice; 1 cwt. Brown soap; 1 cwt. Single soap; 1 cwt. Johnson's crown soap; Two qualities of cheese; 1 flitch of bacon, lard, butter, tobacco and a tin of coffee; Bread was supplied by an outside baker. The venture met with such astonishing success that within the year members were recommending to the committee that another store should be opened at New Lenton. 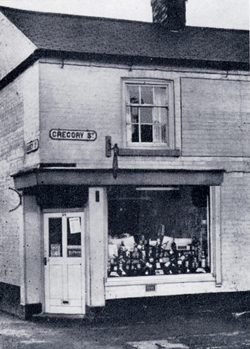 Consequently they chose to open a shop in the premises immediately below the Temperance Room in New Lenton and in 1864 this became Store No.2. Quite where this shop was is difficult to determine but the new Lenton branch eventually moved to new premises built at the corner of Lenton Boulevard and church Street in 1899. If you fail to recognise the location from the photograph, the premises in the picture now house Ladbrokes, the bookmakers. Nothing succeeds like success! A request soon came from Nottingham in the form of deputation that the Lenton Committee initiate operations in Nottingham Marsh area. There was another request for a store in the Bath Street area and more requests were to follow. Expansion continued and in 1873 the nomenclature expanded to match and the Lenton and Nottingham Co-operative Society Limited came into being. These initials can still be seen high up on the side of the Number 2 branch building in Church Street. 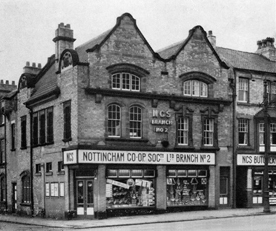 Finally in 1906 Lenton lost its top billing when the Society was renamed the Nottingham Co-operative Society Ltd.
A far more detailed account of Lenton's Co-operative Society taking the story up to 1906 can be found in Lenton Times No.36.